Emmy winner and Mr. Robot star Rami Malek is about to break free. 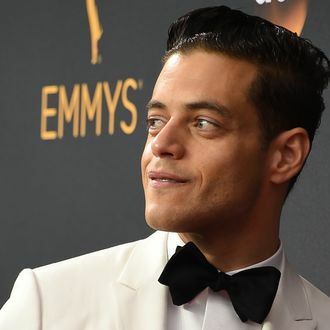 Malek has reportedly signed on to play late Queen singer Freddie Mercury in a biopic project called (of course) Bohemian Rhapsody, Deadline is reporting. The project has been floating around Hollywood in one form or another for almost eight years. Initially, Sacha Baron Cohen was set to slip into Mercury’s jumpsuit, but he left the project over creative differences. The next incarnation was retooled under Theory of Everything writer Anthony McCarten, and now Malek has signed onto this latest version. (Ben Whishaw previously left the role as well.) Along the way, a few directors have entered and exited the project, but as of this writing, Bryan Singer is reportedly considering those duties, which in itself signifies that the film is that much closer to moving forward. And while it’s not great for a film project to stall in development-limbo this long, let us be thankful that the intriguing Malek, who is of Egyptian heritage, will be stepping into Mercury’s shoes; the late singer was of Indian descent, and the last thing a long-gestating film like this needs is a hefty dose of whitewashing on top of everything else.